Over the holiday break, I finally got to try Cafe Lift for the first time, hitting it up mid-week to avoid the weekend brunch crowds. While I had my heart set on a delicious frittata that day, a burger special on their board caught my eye and I knew that I’d immediately have to come back to try it (especially since I really enjoyed the burger at their neighbor/sibling restaurant across the street, Prohibition Taproom). So I did! Their burger consists of two smashed & stacked Kensington Quarters grass-fed beef burgers topped with a fried egg, caramelized onions, provolone and a whole grain mustard aioli. The burger came paired with a healthy, mixed green salad (I know you guys love your fries, but this is a mostly breakfast place, after all). The fried egg covered almost the entire burger, so I only managed to get this peek-a-boo picture. The runny egg yolk tasted delicious and created a beautiful mess all over my plate – and myself. The shiny, buttery brioche helped soak up all the yellow runoff. The caramelized onions & provolone pairing were great. The provolone wasn’t too sharp or overpowering, and the mustard aioli gave it a little extra kick. The burger patties themselves were cooked to well (and continued to cook while I was eating so that they were slightly too dry when I reached the last few bites) but you could taste the freshness in the grass-fed beef. I get the whole “smash” style, but they could have come off the grill a little sooner and been a little bit juicier – and then this burger would have been amazing! If you’re going to come in and check it out (ain’t no shame in eating a burger at 10 AM), don’t forget your piggy banks – Cafe Lift is CASH ONLY! (and BYOB, so bring your flask, too). 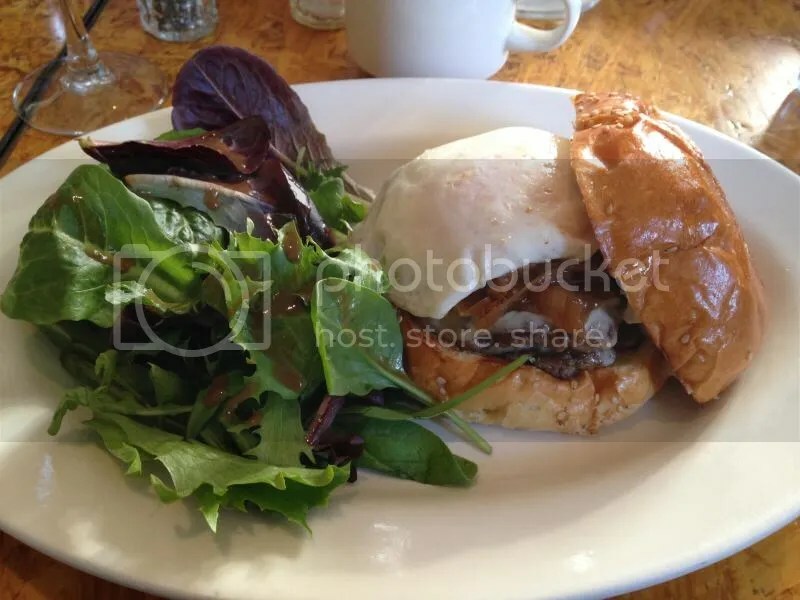 Posted in aioli, breakfast, brioche, brunch, burger, burgers, cafe lift, caramelized, Fairmount, fried egg, kensington quarters, onions, Prohibition Taproom, provolone, salad, smash, spring garden. Bookmark the permalink.